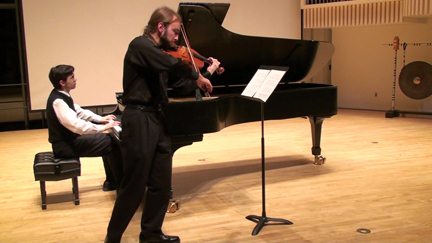 ­Leland Kusmer ’11 (viola) and Andrew Hauze ’04 (piano) performed “Microtures,” by Qian Li ’05. Alumni Council meetings are always packed with activities, including working-group sessions, department receptions, and networking dinners with students. New member Deborah How ’89 added an activity to the list—a Student and Alumni Composers Concert, with music from classical to folk to ambient and a mixture of live performances and video. How hopes to create a network of Swarthmore musicians, and the evening provided a terrific opportunity for some of these musicians to meet and learn from each other. 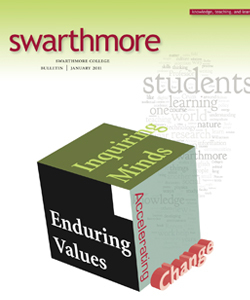 Swarthmore also has a tradition of folk music, and in this vein, Melissa Running ’94 played a Swedish-style waltz on the nyckelharpa and two English country dance tunes on piano with Emily Aubrey ’89 on fiddle. Lacy James ’84 provided a mix of electronic and acoustic sounds in her haunting ballad “Badful Badful.” Lisa Wildman ’84 demonstrated her versatility with the song “God Bless America, Cold Beer to Go,” a political satire that’s earned the fury of the blogosphere, and a solo classical flute piece by the late Roxanna Glass ’91. Qian Li ’05 enjoyed revisiting one of his older pieces—“Microtures”—for viola and piano. The works of Martín Carrillo ’97 and Mark Alburger ’79 were featured via video, and David Barnes ’88 submitted an audio recording of his ambient piece “Solitude.” James Matheson ’92, who led a master class for student performers the next day, described his work for six-hand piano “On Spaces,” played by How, Rachel Kolb Moore ’91, and Andrew Hauze ’04. 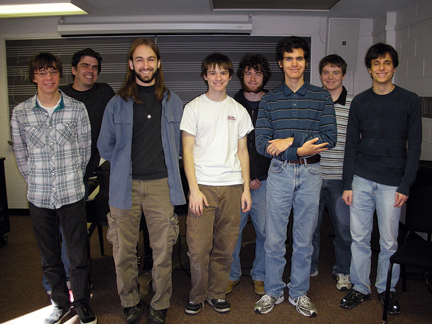 James Matheson ’92 (second from left) led a master class for student composers Niels Verosky ’14, Leland Kusmer ’11, Ben Kapilow ’13, Dan Kurz ’11, Alejandro Sills ’13, Josh Vertolli ’12, and Gabe Riccio ’11. Reaction to the concert was enthusiastic. Lacy James commented, “It was such a wonderful opportunity to share musically with other alums and students.” Council member Rich Wilson ’73 was “impressed by both the quantity and quality of the compositions by students as well as the breadth of styles included.” With the great success of this alumni-student concert, How is planning a faculty-student composers concert in April.